The Beatles' first visit to the United States was in 1964. Clever publicity agents arranged a meeting for the band with Cassius Clay. He was training for the bout that would make him heavyweight boxing champion. The result was a memorable photo of a whooping Clay. He was standing astride four "knockout victims." Clay, of course, later changed his name. He became Muhammad Ali. 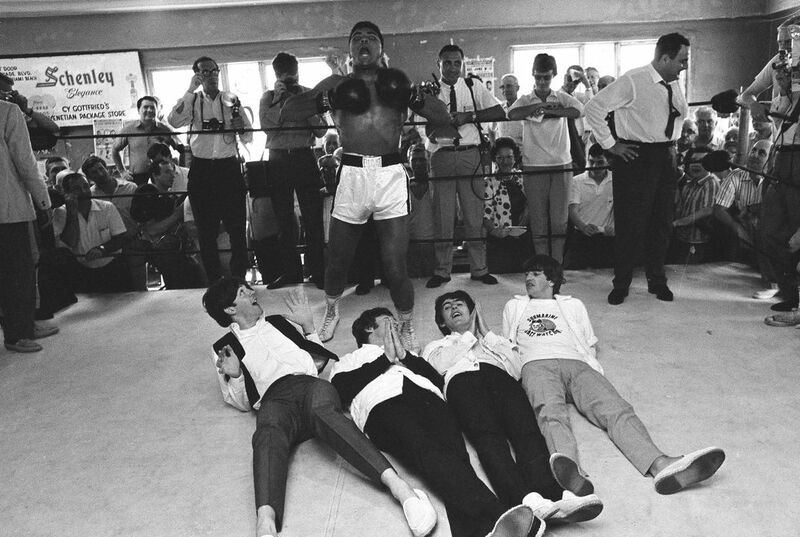 The Beatles and Ali were two emerging cultural forces. They were just beginning their path to global fame. But as popular as the Beatles became, it was Ali who went on to become the most recognized person in the world. That photo was among the first to show him growing into that persona. He would take his place alongside the major cultural, political and entertainment figures of the era. Ali died June 3 at age 74. In the 1960s and 1970s, Ali became far more than a boxer. His identity blended boundaries. He was an entertainer. He was a man at the center of swirling political and cultural change. He was a hero -- and a villain -- to many. This was for his brash self-assuredness. "Part of Muhammad's greatness was his ability to be different things to different people," retired basketball star Kareem Abdul-Jabbar wrote on Facebook. "To sports fans he was an unparalleled champion of the world, faster and smarter than any heavyweight before. To athletes, he was a model of physical perfection and shrewd business acumen. To the anti-establishment youth of the 1960s, he was a defiant voice against the Vietnam War and the draft. To the Muslim community, he was a pious pioneer. His convergence to Islam tested America's religious tolerance. To the African-American community, he was a black man who faced overwhelming bigotry the way he faced every opponent in the ring: fearlessly." The stoic generation that had fought World War II returned home to raise children who became defined by rebelliousness, impatience and an unwillingness to accept things the way they were. Few people embodied that spirit quite like Ali. To his job, he brought a joy and brutal efficiency. Ali didn't just beat opponents. He predicted which round he'd deliver the whuppin'. He spouted poetry while mugging for the camera. Ali talked trash before the phrase was even invented. "This might shock and amaze ya, but I'm going to destroy Joe Frazier," he said. Much of it was good-natured. But his battles with Frazier later became ugly and personal. Ali wasn't simply a loudmouth. He delivered on the promises. He was like Michael Jordan became in another era. Ali was an athlete whose excellence could be appreciated by close and casual followers of his sport. But even Jordan couldn't reach the profile that Ali did. Outside the ring, the court fight over Ali's refusal to fight in the Vietnam War cost him three years at the peak of his career. But it earned him respect among the growing number of people turning against the war. His conversion to Islam, with his abandonment of the birth name Cassius Marcellus Clay Jr., tested the deepness of Americans' support for religious freedom. It all made Ali the subject of countless arguments. Everyone took sides. This was especially true when Ali returned from his suspension for refusing to join the military. Whether or not you rooted for Ali often had little to do with boxing. And think of it. When's the last time you argued with anyone about a heavyweight championship boxing match? Ali became one of the most recognizable people on Earth. "One of the reasons the civil rights movement went forward was that black people were able to overcome their fear," HBO host Bryant Gumbel told Ali biographer Thomas Hauser. "And I honestly believe that, for many black Americans, that came from watching Muhammad Ali. He simply refused to be afraid. And being that way, he gave other people courage." Ali's transcendent force included comic bravado and physical beauty. It also included his insistence on being the master of his own story. He became the athlete most favored by singers, intellectuals, filmmakers and other artists and entertainers. Ali's verbal sparring with sportscaster Howard Cosell helped make the latter's career. When Ali traveled to Zaire in 1974 for his "Rumble in the Jungle" against George Foreman, he was joined by musical stars. They included James Brown, B.B. King, Miriam Makeba and others. His legacy is captured in songs and prose that span decades. Author David Maraniss wrote about Ali in "Rome 1960: The Olympics That Changed the World." Maraniss called him a "gift to writers because he offered so many themes. Bravery. Pride. Humor. Blackness. Universality. Ali's fight against Foreman became the subject of an Oscar-winning documentary. It was titled, "When We Were Kings." In 2001, actor Will Smith starred in a Hollywood story of the boxer's life. It was titled, of course, "Ali." Ali also inspired songs from around the world. Parkinson's disease quieted the man in his later years. But his fame never was more evident than in 1996. It was during the opening ceremony of the Olympic Games. They were in Atlanta. 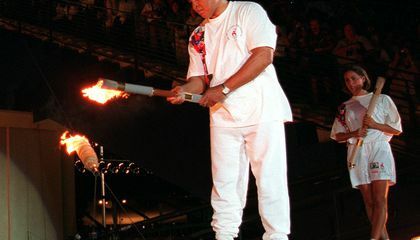 The reception given to a halting Ali as he lit the Olympic torch made it clear he had transformed from a polarizing to a beloved figure. How did Muhammad Ali transcend sports? He overcame all the hatred he was getting, and defied the limits. He also changed religions, which made people think twice about him. He had many followers, casual and close. Finally, he had a spirit in him that made him excited and energized. Ali showed sportmanship and also no sportmanship here are many ways he showed sportmanship and no sportmanship One way Ali did not show sportmanship was " Ali talked trash before the phrase was invented." This quote showed that he trash talked to other people with bad behavior. " He was an entertainer". This quote shows sometimes he showed sportmanship while fighting his opponents. One example that Ali displayed poor sportsmanship was when he started talking trash about other people he was going to wrestle. One quote that I found said " Ali talked trash before the phrase was even invented." This means that he talks about people in a bad way but he should talk about them in a good way before the game starts and ends. One way Ali is displaying good sportsmanship is when he plays but plays with sprit when he plays and gets inspired by his playing. In this quote it says "Ali was also inspired songs from around the world." This is good sportsmanship because he is getting inspired by how he plays and his sportsmanship of playing. 1.) One example of Ali showing bad sportsmanship is when he talks trash to his opponent.This is shown in the quote, "Ali talked trash before the phrase was even invented. "This might shock and amaze ya, but I'm going to destroy Joe Frazier," he said." This shows Ali being disrespectful towards his opponent. Also known as bad sportsmanship. 2. One example of Ali showing good sportsmanship is when he gave people courage. This is shown in the quote, "He simply refused to be afraid. And being that way, he gave other people courage." this is good sportsmanship because it is good treatment towards others. Muhammad Ali was well known for being fearless which helped others to overcome their fears.